A longstanding conspiracy theory that the Nazi war criminal Rudolf Hess was replaced by a doppelganger in prison has been debunked. “No match would have supported the impostor theory, but finally we got a match,” said Prof Jan Cemper-Kiesslich, of the University of Salzburg, a co-author of the research. On the night of May 10, 1941, a Scottish farmer named David McLean found a German Messerschmitt airplane ablaze in his field and a parachutist who identified himself as Captain Alfred Horn. McLean's mum was soon serving him a cup of tea by the cottage fireside, but their surprise guest was no ordinary Luftwaffe pilot. Incredibly, he was Rudolf Hess, a longtime Hitler loyalist, to say the least. Hess joined the Nazi party in 1920, stood with his friend Adolf Hitler at the Beer Hall Putsch, and served in Landsberg prison -- where he took dictation for much of Mein Kampf. As deputy Fuhrer, Hess was positioned behind only Hermann Goering in the succession hierarchy of the Nazi regime that had Europe firmly under the heel of its jackboot. The Hess flight was remarkable in itself. He left an airfield near Munich in a small Messerschmitt fighter-bomber a little before 6 p.m., flying up the Rhine and across the North Sea. Hess displayed considerable skill by navigating such a course alone, using only charts and maps, on a foggy dark night over largely unfamiliar terrain—all while avoiding being shot down by British air defenses. By 10:30, Hess was over Scotland, out of fuel, and forced to bail out just 12 miles from his destination. That unlikely site was Dungavel House, home of the Duke of Hamilton. Hess hoped to make contact with one of the highly placed British figures who, unlike Churchill, were willing to make peace with the Nazis on Hitler's terms. Hess believed that Hamilton headed a faction of such people and immediately asked his captors to be taken to him. But Hess was misinformed. Hamilton, who wasn't home that night but on duty commanding an RAF air base, was committed to his country and to its fight against Germany. The unlikely envoy's mission quickly took a turn for the worse. When granted a meeting with Hamilton the next day Hess's pleas fell on deaf ears. Worse for Hess, he denied from the start that Hitler knew anything of his mission, which meant that the British afforded him none of the diplomatic respect to which he thought he'd be entitled. Instead he was imprisoned, and by the night of June 16, the obvious failure of his mission left Hess so mentally shattered that he attempted suicide by hurling himself down a flight of stairs. Hess spent the war in British hands, confined in various locales including (briefly) the Tower of London and a military hospital at which he was even allowed guarded drives in the country. He was visited frequently by intelligence officers eager for secrets and by psychiatrists eager to plumb the Nazi mind—which in Hess's case increasingly showed serious signs of mental illness. The psychiatric examinations were rooted less in concern for Hess's mental health than in the hope that this fanatically devoted Nazi could provide them valuable insights about how the criminals ruling Germany, including Hitler himself, thought. Hess was transferred back to Nuremberg for the post-war trials in October, 1945, where he escaped the hangman but was sentenced to life in prison. He spent the rest of his long life, 46 years, as Prisoner Number 7 in Spandau where he lingered long after the other Nazis were freed. Hess was the facility's only prisoner for more than 20 years, his term ending only when the 93-year-old was found hanging from a lamp cord in a garden building in August 1987. The suicide was denounced as a murder by those, including Hess's own son, who suspected he'd been silenced. But an enduring rumour before Hess even reached Spandau was that the inmate was a doppelganger. The study’s authors say his doctor at Spandau prison was among those who believed the theory, pointing to doubts about his journey to Scotland, his refusal to see relatives until 1969 and his “claimed amnesia”. The theory was also believed in the highest echelons of political life, including by the former US president Franklin Roosevelt. Hess’s family, however, disputed the idea. Writing in the journal Forensic Science International Genetics, Cemper-Kiedslich and colleagues report that their conclusion is based on analysis of a blood sample taken from Spandau #7 in 1982. The sample was hermetically sealed on a microscope slide kept for years for teaching purposes by another of the study’s authors, Rick Wahl, a former US army pathologist. It was a fortunate situation: Hess’s body was disinterred and cremated in 2011 to avoid his grave becoming a site of pilgrimage for neo-Nazis. The team tracked down a distant male relative of Hess, whose identity they are careful to protect. According to the New Scientist, which first reported on the study, the man agreed to give a DNA sample and the team compared it with that of Spandau #7, looking at DNA markers across the genome..
Cemper-Kiesslich told the Guardian the key was to look particularly at the Y-chromosome. “Usually the DNA markers that are used for paternity testing don’t work out for distant relatives. But on the other hand we knew that both sample donors [if Spandau #7 was Hess] shared a common paternal line,” he said. With Y-chromosomes passed down from father to son, that offered the possibility of a different analysis. “Persons with an unbroken paternal line display the same set of DNA markers on the Y chromosome,” said Cemper-Kiesslich. The authors say the people who carried out the analysis were unaware of the story of the samples until after the results were in. The results showed that the two people from whom the samples were taken were more than 99.99% likely to be related. It sometimes seems that, in addition to the lake monsters said to populate many major lakes of the world, the smaller bodies of water get less attention. Yet there are plenty of very small lakes and ponds that also allegedly have their mysterious denizens, and it seems that one only needs a decent bit of water sitting there to spawn legends of things roaming about beneath the surface. While lake monsters like the Loch Ness Monster and other big hitters of its ilk get all of the attention, lets look at the little guys, and the more little known mystery beasts that allegedly call various ponds home. One relatively well-known pond monster is said to have made its home at the small town of Churubusco, Indiana, at a place called Fulk Lake, which is actually more like a pond, located on a remote, rural farm in the area. The first main sighting of the strange creature came out in 1898, when the farmer named Oscar Fulk was out fishing there one day on property and said that the monstrosity had come bubbling up out of the murk to reveal an enormous, “prehistoric looking” turtle, with a head the size of a human’s and a neck as “thick as a stovepipe.” Whatever it was disappeared back into the muddy water and would not be sighted again for many years. In 1948, two men named Ora Blue and Charley Wilson went out fishing on the lake and they too reportedly spotted a gargantuan turtle with a shell as big around as a car, which was enough to get the attention of authorities, worried that there could be something dangerous lurking under the placid surface. Shortly after this the owners of the lake at the time, the Harris family, also began to sight the giant turtle there from time to time, to the point that in March of 1949 Mr. Harris decided that he was going to try and capture the gigantic monster himself. To this end he meticulously set up an array of stakes and chicken wire in the area where it was most frequently seen, a stagnant cove only about 10 feet deep. Apparently the creature actually approached and circled though the brown depths, but did not fall for it and remained elusive. In the meantime the media was having an absolute field day with the idea of some prehistoric monstrosity in the pond, calling it variously the Beast of Busco or just Oscar, and the search for the beast became an event that drew great curiosity, pulling in hundreds and then thousands of people who came to gawk, as well as reporters from all over the country, many of them who did not take any of it seriously at all. Harris and his friends ignored all of this, instead focusing on creating ever more sophisticated and elaborate traps to try and capture it, as well as a periscope-type device that allowed them to peer underwater in an attempt to catch sight of it. Harris was even able to procure a diving suit and try and actually literally walk down to the bottom, a plan that was thwarted by a leaky mask. Other divers were also getting in on all of this, but the extremely poor visibility down there meant the beast could have been sitting in the silt and muck right in front of them and they’d never know. The search was half-media circus and half-joke to a lot of people, generating several hoaxes such as a couple of men who claimed to have captured it and then offered a sea turtle head as evidence. All of the trickery and lack of results meant that media interest faded, but Harris was still hard at work, getting increasingly desperate to prove that it was really there, using dynamite charges and even attempting to drain the whole lake of its water. As the water began to flow out, there was a spike of public interest once again, as people just couldn’t resist the curiosity of seeing what would be lying there on the exposed muddy bottom, and crowds began to flock there once more. During this time there were some onlookers who claimed to have seen the beast, one even saying that they had seen it eat a duck. Alas, the efforts to drain the lake failed when the nearby dam to which they had been diverting water broke, and the pump they had been using broke down. The lake was now just a muddy sliver of water, but it could be drained no further. Desperate and seeing the end of his quest so near, Harris and company tried dredging the bottom of the depleted pond, but rain would gradually fill the lake once again before they could finish. All of this had not come cheap, and considering what a money pit the search for the Beast of Busco had become Harris finally threw in the towel. The Beast of Busco would then fall into obscurity, and it is still unknown if there was ever anything there at all, although it has been speculated that it must surely have been an outsized and very out of place alligator snapping turtle. As to why it has not been seen since, theories run from that has died to that it escaped via an underground tunnel system, perhaps the same one that had allowed it to get into the pond in the first place. We will probably never know. Whether it really ever existed or not, interestingly the town of Churubusco to this day still has an annual festival dedicated to the beast, called “Turtle Days,” where one can enjoy all manner of turtle themed activities. 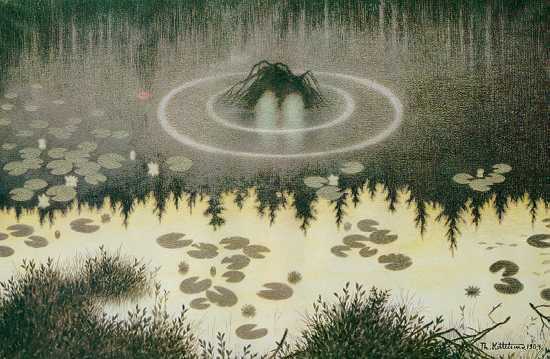 Also in the U.S. is an alleged pond monster that seems to be pretty mired in folklore but is still interesting nonetheless. In the northeast portion of state of Maine there is a tiny pond called Boundary Pond, which according to reports going back centuries is home to a curious creature called the Billdad. This strange creature is said to be about the size of a beaver, with powerful hind legs like those of a kangaroo, which allow them to supposedly jump vast distances, as well as webbed feet, a thick, flat tail, and a vicious looking curved beak. It supposedly lies in wait for prey at the water’s edge and when a fish surfaces it will stun it by slapping the water with its tail. The creatures were supposedly often seen by woodsmen and lumberjacks, and their meat is said to be poisonous. It was really weird. It had a snake’s tail. It was really long and really big in the middle and it had fish scales. It stayed there for a couple of minutes, but it wouldn’t turn so I could see its face. It was acting like it was strangling a fish or something. It looked bigger than a snake. It had a lot of girth. But it was long. Some friends say, ‘Oh, that’s a carp, but it kind of slithered through the water. Kenner managed to snap a photograph of the mysterious creature, and when he posted it to his Facebook page people began to come out of the woodwork claiming to have seen the same thing, although employees in the area have reported nothing amiss. Moving out of the United States we come to a rather infamous pond in Japan with its own purported monster, called Takanami Pond, in Niigata prefecture. The pond itself lies 540 meters (1,722 feet) above sea level in a wilderness area, and is known for its pristine wilderness, camping, and hiking trails. It is also allegedly home to an enormous fish locals affectionately refer to as the Namitaro. The fish is said to be between 2 to 4 meters (6.5 to 13 feet) in length and covered in large scales. The Namitarou rarely comes to the surface, but is known to startle people strolling along the pond from time to time. Fishermen have also claimed on occasion to have caught the beast, only to have it break their lines. One report of a more close encounter described how a man had entered waist high water in the pond to retrieve something he had dropped. As he blindly felt through the murky water and silt at the bottom, his hand came up against what he took at first to be a large log at the bottom. It was only when this “log” suddenly began to swim away that he realized it was some incredibly large fish. The mysterious fish was so large and powerful that the sweep of its tail as it swam off actually bumped into the man and knocked him down. The man described being terrified, and quickly exited the water to see a large wake as whatever it was sank into the depths. The pond is an odd place for such a large cryptid, as it is small and shallow, being only 13 meters at its deepest point. In addition, the area is quite popular for its hiking and camping, and there are many campgrounds, parks, shops, and restaurants in the vicinity of the pond. The Namitaro has become somewhat of a legend in the area, and most people who pass through pause at the pond hoping to catch a glimpse of the elusive creature or the large wakes and waves it is said to produce as it cruises under the surface. These waves are so well-known that indeed the name Namitaro is a combination of the Japanese words for “wave,” nami, and Taro, a common Japanese first name, sort of like “John” for Westerners. It has been speculated that the Namitaro could be a specimen of a large species of Asian carp, such as the grass carp or black carp, that has somehow been released into the pond and grown to epic proportions. These species of carp get to very large sizes that are comparable to what people have seen in the pond. The black carp, for instance, can reach up to 6 feet in length and weigh over 200 pounds. An even larger species, the Siamese giant carp, can get up to around 10 feet long. These have just been a few cases of many of very strange things lurking within the smallest of bodies of water. It shows that one does not necessarily need an expansive lake and miles of shoreline to have instances of something strange in the water, and one wonders how these things came to be and how they can remain so hidden, indeed if they are even real at all. One thing is for sure is that the water draws us and the mysteries of what lie beyond that reflective surface seem to invite tales of the unknown. 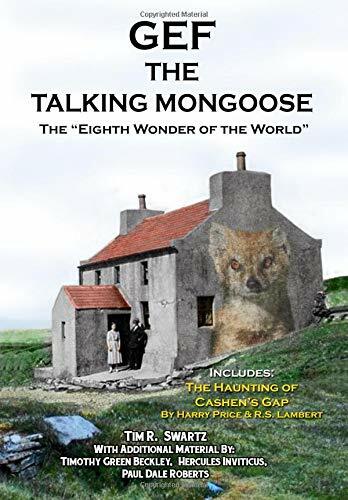 Whether any of these creatures ever really existed at all, it is fascinating all of the same, and adds to the lore of cryptozoology in their own unique way. Early in the summer of 1947, an amateur pilot from Idaho named Kenneth Arnold spotted something in the Washington skies that kind of blew his mind. Despite the skies being clear that day, he saw a series of nine flashes of horizontal light. He landed, told others what he saw, and his story spread through the popular consciousness, taking on a life on its own, as well as a name—the flying saucer. Two weeks later, a much more famous incident in Roswell, New Mexico, involving a weather balloon (if you believe what the government tells you), further cemented the idea of the flying saucer in the public consciousness. Not long after, hobbyists of all kinds suddenly felt inspired make their own—and they’ve been flooding the patent offices globally ever since. But the guy who got to the U.S. Patent Office first, surprisingly, wasn’t actually inspired by the popular perception of the UFO at all. He had the idea, in fact, years before Kenneth Arnold took his fateful flight. The Dutch painter and sculpture artist Alexander Weygers, who grew up in the Dutch East Indies—now Indonesia—and spent most of his adult life in the U.S., was something of a 20th-century Leonardo da Vinci. He had both an engineering and artistic background, and his work spanned sculpture, illustrations, photography, and many other fields. In 1927, he conceptualized a device that predicted the infatuation with flying saucers before they even had that name. And as an engineer, he did so with a practical eye toward the failings of the device he hoped to replace. His creativity was driven by tragedy. In 1928, his wife died during childbirth, as did his son. The painful incident ended up pushing him closer to art, with the losses inspiring some of his most notable sculptures. But the existence of everything that came afterwards meant that his name would forever be associated with futurism and science fiction, elements that didn’t actually inspire his invention. 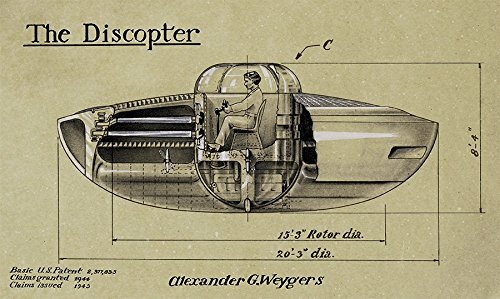 Soon after the flying saucer hit the public consciousness in the late 1940s, people noticed what Weygers had done. A 1950 article in the Allentown, Pennsylvania, Morning Call, dedicated column space to a dentist named Dr. Harold T. Frendt, who used the existence of the patent to argue against the existence of aliens. Frendt suggested that the patents were being used to create these saucers, despite his only evidence being Weygers’ patent. During his service in the army Weygers was given a Carmel Valley property where, over several decades, he and his wife, Marian, would build a retreat with a residence and studios, while he pursued his career teaching at Berkeley. Marian Weygers, his second wife, had graduated from the University of California at Berkeley as an art major where she worked and studied under Chiura Obata, who taught her the ink wash painting and design. She developed a printmaking process that she named "imprints from nature", using natural materials such as flowers, leaves, and grass as well as rocks and insects. Alex and Marian Weygers relocated to the Monterey Peninsula in the 1960s and settled into their former retreat in Carmel Valley that then served as their home and studios. This was the location of his death at the age of eighty-seven. Marian remained very active in environmental and civic issues in Carmel Valley until her death in 2008. There is no proof that Yowies exist. There is no hard evidence, no specimens, no bones, but plenty of reported sightings. In Australia, it’s the Yowie. But their existence hasn't been conclusively proven or verified by science and most stories rest on folklore or eyewitness reports.